We have just uploaded the 79th episode of the Alien vs. Predator Galaxy Podcast (right-click and save as to download)! 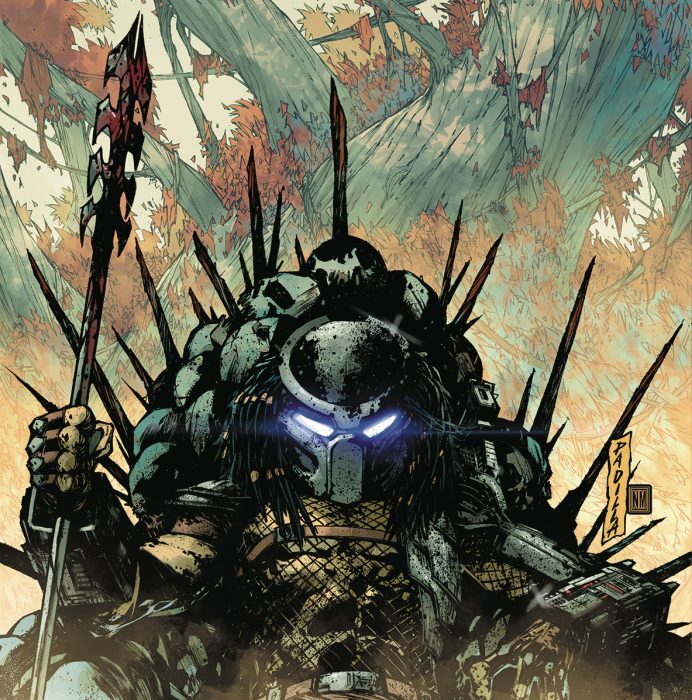 The latest episode of the podcast sees RidgeTop, Xenomorphine and I reconvene to talk about Dark Horse Comics’ latest Predator series, Predator: Hunters 2! We discuss Swain’s redemption, bringing in Project: Stargazer, whether we’d like to see the Emissary Predators make an appearance alongside the Hunters, how much we’d love to see Predator: Hunters 3 and plenty more! Beware spoilers for Predator: Hunters 1 & 2! When Xenomorphine brings up breast-less representations of female Predators, we neglected to mention Big Mama’s appearance in Aliens vs. Predator: Deadliest of Species. Just finished listening to the podcast - thanks you guys for accompanying me on my errands this morning Really appreciate the work you put in to getting these podcasts to us. This series really is a testament to how Predator is intriguing and entertaining on its own, without AvP snaked in there. First, love the artwork throughout the comics. Each issue was just gorgeous and fitting in its own right. The gore was great, the shots of the Predator were masterpieces, especially some of the closeups in the last chapter. I liked Atal's role. The disability, his friendship with Swain. He was written well, very empathetic and not a chore to read, not in the least. I wished just he wouldn't have stayed behind in the end. I sort of waffle back and forth between the team up idea. On one hand, it has the potential to easily end up being a cheeze-fest. However, if done well, it could add so much to the story and open up a lot of possibilities. I like the way it was done in Lebbon's trilogy. It was reluctant, and believable. It kept with the traditional portrayal of Predators and how they behave, fight, etc. I would even be excited to see an emissary-type or "police"-type figure participate in a team-up without it being reluctant. It'd just have to ensure that the Predators remain in character. Keep their separate psychology, their way of thinking distinct from ours. Very true. And that Predator ends up coming out of that draw on top as we find out in War. One of the AVP comics had a pretty good draw, where both the main Predator and main Human's parties were killed fighting each other, but the two teamed up to fight a PredAlien. Like I mentioned in the episode, that's one of the things I like about If It Bleeds - Predators actually survive. And it's also a disappointment I had with Hunters, I was hoping for a recurring Predator baddy. It wasn't enough to ruin the series for me, though. I agree with nameless 1 id go see a darker predator film where maybe only a child survives. All main characters are killed. Even will settle for a draw where pred is bested but main hero dies from the nuke. Especially at ground zero cough cough Dutch?!! That was a great listen! Thanks for the very kind words on the art and color! No worries! Thank you for listening and for your work! Can't say I'd be excited for Hunters 3. They did nearly the same exact story for Hunters 1 & 2, with nearly the same ending. Writers need to start doing stories that don't rely on the tired crutch of humans vs Predator, it ends the same way nearly every time, some humans die, but the Predator is killed by the last few survivors. What's the point of reading these comics or watching future films if we already know how it's going to end? The first Hunters book had the potential for flipping the premise of the first movie, where we have a advanced, fully equipped team hunting a Predator with primitive weapons. It could have been a great display of the Predator's intelligence, cunning, and skill. Instead the writers wasted it on another by the numbers story. You beauty. Always look forward to these pods. Our new poddy is about Hunters 2 and it's up now!